Seven years ago when I was choosing countertops for our own kitchen for our Auckland based home, I exhausted myself researching all the choices that were on the market and finally settled on a marble countertop + wood on the island combo. I’ve never regretted it, But seven years have passed and much has changed in the world of kitchen countertops. We have other kinds of countertops in our home, white laminate in the laundry room, wood in the hall bathroom, and modern cultured marble in the master bathroom. All have performed well based on our expectations. Innovation is inevitable, trends come and go, so the decision as to which countertop to choose in a kitchen remodel requires much consideration. Let’s start with a classic favorite. Marble will never go out of style so for the price you pay, you do get the “timeless” label with the investment. Always elegant, it complements both Old World and modern kitchens equally; for bakers it’s a favorite, no surface is better for pies and pastries. Properly sealed marble cleans up easily with a mild cleanser and cloth. Marble can stain so it must be sealed, and since it’s softer than granite, it can chip easily (we’ve suffered several small chips around our kitchen sink). Any acidic food like citrus can etch the surface or leave white stains. There are two varieties of gray and white Italian marble that are similar in appearance, both milky white with gray veining, and they are Carrara and Calacatta. Carrara has more delicate, lighter veining; Calacatta is a rarer, pricier stone and has bolder more defined strokes, yet both are a desirable luxury stone. Calacatta Gold and Crema Marfil marbles have brown or gold veins and offer homeowners warmer tones. Wood countertops are having a moment in the spotlight right now with butcher block being so affordable from sources like our partner NOB Building Supplies. Wood countertops are higher maintenance than stone, they require sealing with various natural products like beeswax or mineral oil, or waterproof varnishes. Wood countertops cannot withstand heat which requires the consistent use of hot pads or trivets. Water spills or rings can leave permanent marks if moisture is left too long, but they have classic appeal and add a warmth that no other countertop can compete with, especially in traditional, craftsman, or cottage style homes. The use of wood in any space brings character to your home and when cared for properly, wood countertops will remain useful and beautiful for years. Quartz kitchen countertops are manufactured man-made surfaces with contemporary appeal created from pigmented resin and ground quartz chips. They are readily available in multiple colors and in either honed or polished sheens. Quartz countertops share the durability of stone but are easier to care for since they are non-porous and anti-bacterial.For the most part, you won’t find the natural variegation that you do in granite or marble products yet some natural quartz manufacturers like Cambria are mimicking them well. Granite has been the countertop of choice for many contractors and homeowners since the 1990s. Many granites have a speckled or mottled surface with varied colors throughout but they are extremely durable. Although porous, when sealed granite resists stains, withstands heat, and is waterproof, hence the popularity. Solid surface countertops like Corian are artificial, made of acrylic and polyester; they are non-porous so sealing is not required. They can scratch or burn under extreme conditions but any mistakes can be sanded out so they are virtually maintenance free. Limestone is made of calcite and is shaped from sand and aquatic life (and fossils) over time. It’s softer than granite, yet heat resistant and moisture proof when sealed. Limestone is available in off white to sand tones and shows a beautiful patina with age. Limestone is often honed and because it is softer porous stone it can scratch easily and requires sealing. 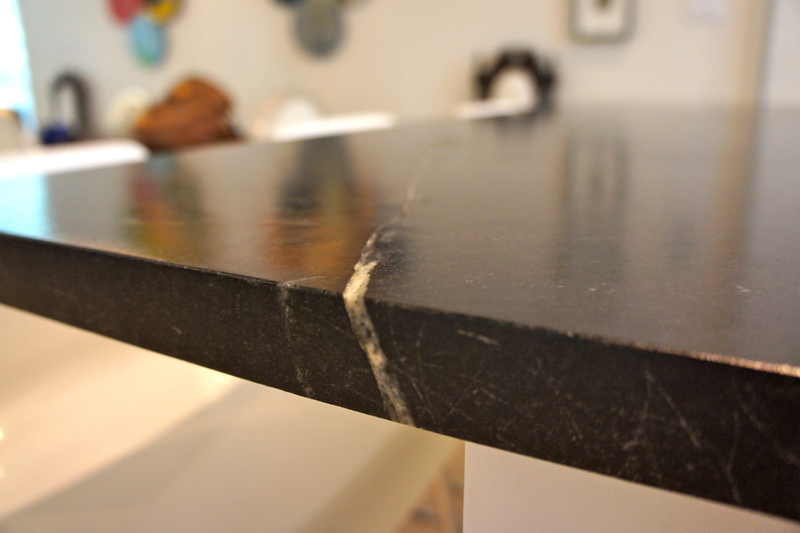 Like concrete (see below) soapstone is growing in popularity as a kitchen countertop material of choice. When installed it’s often a medium gray tone that deepens over time to a more charcoal color. It’s composed of mineral talc and some slabs can have a green tint, the material is often used in labs because it is heat and chemical resistant. Soapstone is a softer surface like marble; it requires polishing to avoid cracks and can scratch or nick but it is water resistant. Laminates are manufactured with a blend of resins and paper fused to particle board and they have been a budget smooth countertop surface for decades. In the past, laminate hasn’t always had a reputation as stylish, but that’s all changed, there are several reasons to choose laminate countertops as the newest designs mimic marble, granite, and limestone. In the past, laminate countertops required an over mount sink but as one reader pointed out (see comments), that’s not the case anymore. This style is trending in the past few years and for good reason. Concrete is practically indestructible and is both heat and scratch resistant. These countertops are either precast based on a template or poured on site, the labor intensity adds to the price per square foot which is often $100 or more, but look how fabulous they can be! There are so many other countertop products coming to market in recent years, how can anyone keep up !? Zinc, recycled glass, stainless steel, the list goes on. What solid surface countertop(s) do you have in your kitchen? Are you pleased or displeased with yours?